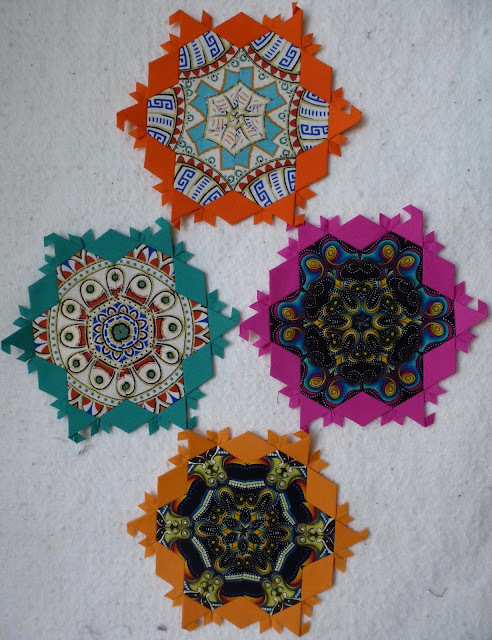 I have a very bad case of quilters EPPing A.D.D. I’ve been watching one particular quilt on Kathy’s link up for quite some time. It’s shown here. She had a link to the designer’s blog last week, and I made the huge mistake of clicking on it. Little did I know that it’s a free pattern, done in instalments on Grit’s Life. I’ve been dithering back and forth all week about starting yet another EPP project. After all, I have my Rainbow triangles, my jewels for Creme Brûlée, new ones this week and then the full collection, so far, and the Rainbow Stars as well. The rainbow stars are out visiting at a quilt shop, so I don’t have pictures of them. But, as the borg in Star Trek say, resistance is futile. I went diving through my 1 1/2 inch scraps to find teal and yellow and red, since those are the colours I’d like to use. This is what I have, so far. There is a showing of the full first season of “Victoria” on PBS starting at 4 pm this afternoon, going through until tonight. So this will be my TV busy work for tonight. I’m linking up to Kathy’s Slow Sunday Stitching, and then I’m going back to playing with my hexagons. I’ve been hand stitching all week, little bits at a time in the evenings. The more I do of this EPPing, the more I love it. I finished up the teal star I was working on last week but didn’t get pictures of it finished. We took a short trip out to Joan’s shop in Mt Brydges, Sew Creative, and she is carrying some of our “Little Bits”. I left her the purple star and the teal star to use as samples. It looks like it will be the end of March before we have a web site up and running for selling these. 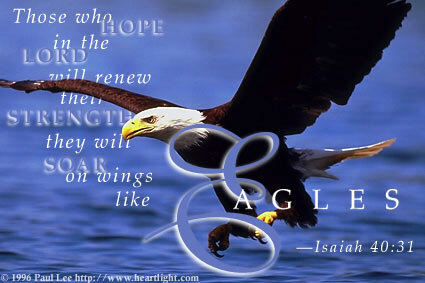 In the meantime, if anyone is interested, email me at eagleswingsquilts@icloud.com, or leave a comment here on the blog. If you do leave a comment, make sure you aren’t a no reply blogger and that I can reach you. If you’re not sure, it would be better if you emailed me directly. I can do custom sizes, or any of the regular popular sizes. We are also doing up acrylic templates for the EPPing shapes. I am discovering that it is fun, and also dangerous to have ready access to all kinds of shapes and sizes. To someone with quilter’s A.D.D it’s like letting a kid loose in a candy shop. But I’m having tons of fun!! I’m continuing to work on the fussy cut jewels that will eventually end up being Creme Brûlée, a design by Willyne Hammerstein in her second book. I have 4 done and a fifth one started. We’re having all the family over for the afternoon and for dinner this evening. So the stitching time today might be a bit limited. I’m going to try to at least get the blue edging onto the partially finished jewel. And maybe some more pieces fussy cut and prepared for stitching. In the meantime, I’ll link up to Kathy’s Slow Sunday Stitching. Well, these past two weeks have been a bust when it comes to health. In fact, this whole year, as in the past six weeks clarify as a bust. It’s been cold after cold after cold circulating around between my husband and myself and our grand daughter. Mine ended up in a sinus infection and antibiotics. I’m finally feeling better, but my poor husband is still coughing and sneezing. I really hope it isn’t a new one that he’s going to pass on........ Consequently, there hasn’t been a lot of sewing or stitching or much else of anything else happening in our home here. And certainly nothing worth blogging about. As of yesterday, I began to remedy that. February is the colour aquamarine over at Angela’s SoScrappy. 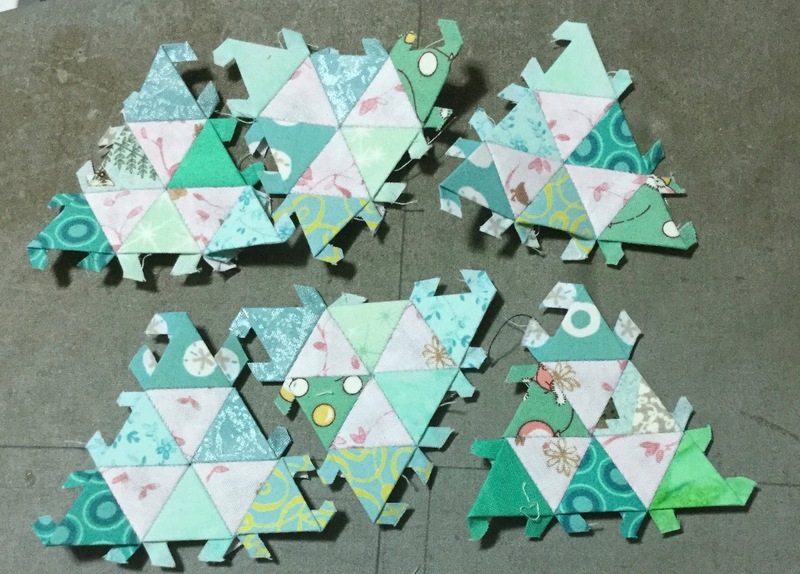 So yesterday, I cut up a bunch of aqua scraps into tiny triangles, along with some pale pink, and started sewing them together. 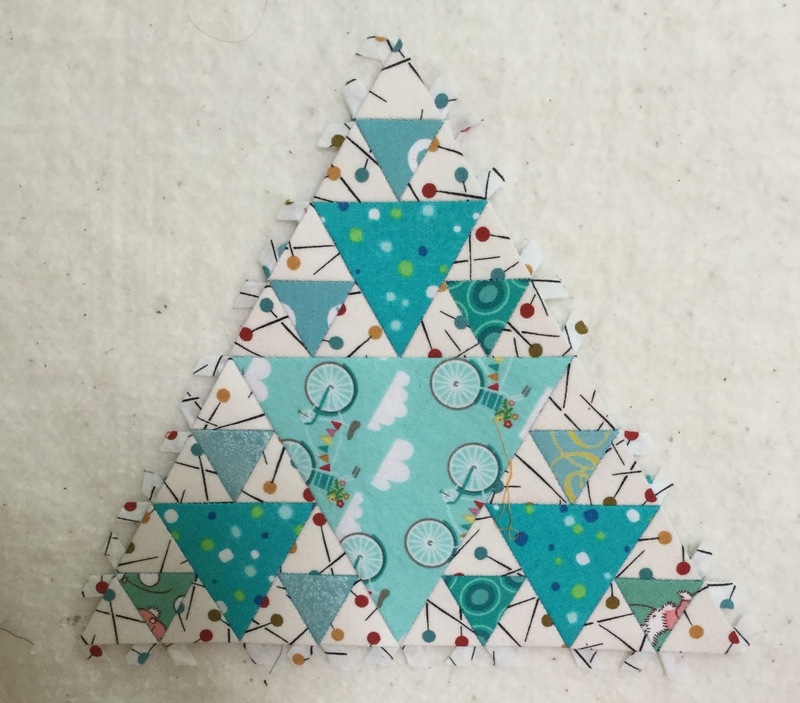 By the end of the day I had the one inch triangles sewn into three inch triangles. 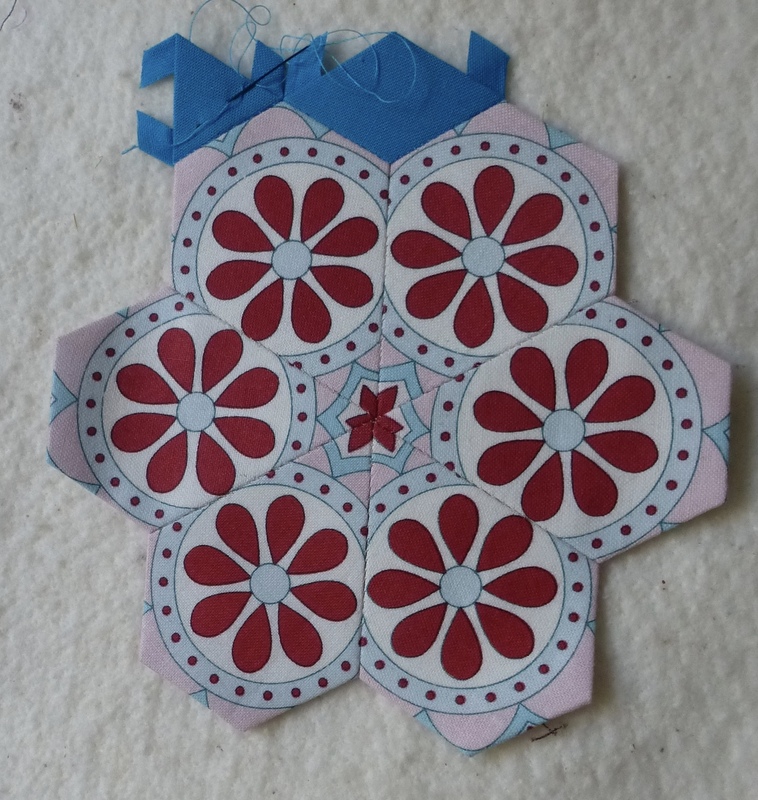 Today I’ve been working on the centre of the star, and have almost all of that done. The pieces are all one inch sides, so it sews together really quickly. 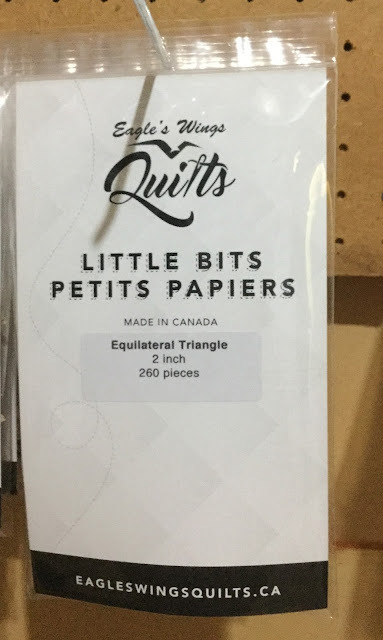 All of these papers have been cut on our laser cutter that will be providing us with papers to sell to the English Paper Piecing Canadian market. All that is remaining to finish is the web site, and we’ll be ready to go. Very exciting!!! 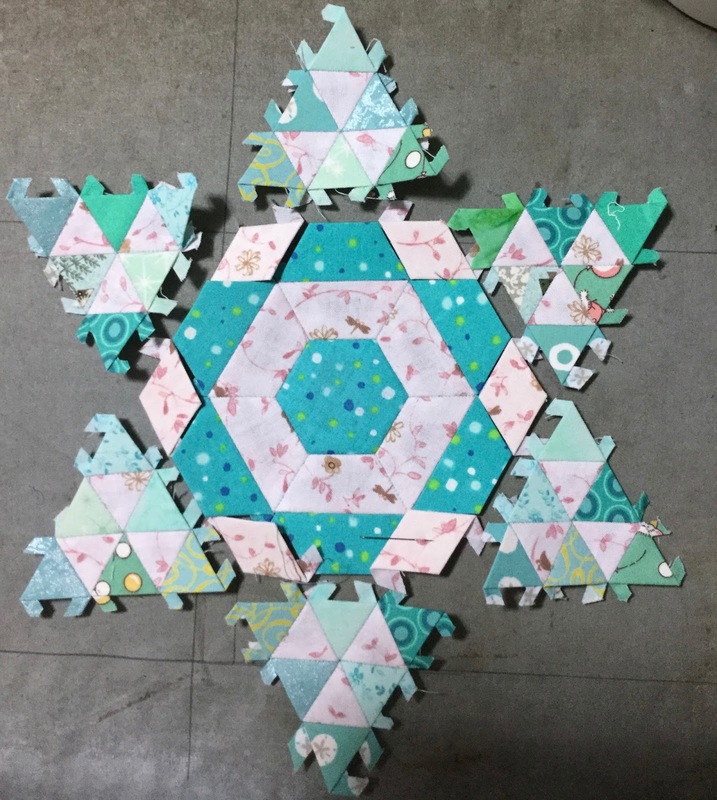 I’m linking up to Kathy’s Slow Sunday Stitching and Angela’s SoScrappy. After that, I hope to finish this star off.